The NHS is considering preventing families from overriding the consent of people who have signed the organ donor register. NHS Blood and Transplant (NHSBT) says it wants to ensure a person’s wish to donate is honoured if they die. In a strategy document it also asks whether those on the organ donor register should receive higher priority on the transplant waiting list. The strategy has the backing of the four UK health ministers. It aims to build on the 50% increase in deceased donation rates since 2008. NHSBT says it wants a “revolution in public attitudes and behaviour” so that individuals and families will be proud to support donation. It says knowledge of organ donation remains low outside the NHS but this can be increased through education and publicity campaigns. Almost everyone would accept a transplant organ if they needed one – but only 57% of families agree to donation when asked. Grieving relatives sometimes overrule the wishes of patients who have signed the organ donor register – although this usually happens when families are not aware of a loved one’s wishes. NHSBT says a shift in behaviour is needed comparable to the changes achieved in preventing drink-driving or smoking cessation. It says the UK will examine systems – such as in the US – where families are not permitted to override pre-existing consent so people can be confident their pledge to donate will be respected. Although there are more than 19.5 million people on the Organ Donor Register, most will die in circumstances where organ donation is not possible. NHSBT says it should also be possible to increase the numbers of people who are able to donate by reviewing end-of-life care procedures. One example is a pilot study in Scotland which gives the option of donation following cardiac arrest and failed resuscitation. Serious debate The strategy calls for a national debate on proposals to increase organ donation. For example it wants to know whether the public would support a system similar to the one in Israel and Singapore where those on the organ donor register get higher priority if they ever need a transplant. Last week the Welsh assembly voted to change to law to bring in an opt-out system of organ donation in 2015. Wales will be only UK country where individuals will be presumed to have consented for their organs to be donated unless they opt out. There are around 7,300 people in the UK waiting for a transplant. Last year there were 1,212 deceased donors. 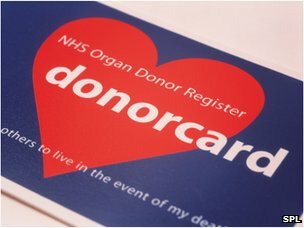 NHSBT says the waiting list “considerably under-represents the true number of people who could benefit from an organ transplant“. It says evidence suggests the demand for transplants is likely to continue to increase in years to come. Interestingly just when donor choice is receiving greater validity & status Wales enacts law indicating that it considers the state shall have the final say & thus owns the donor whether the potential donor agrees or not! Thereby The State shows it considers the electorate acts for the state NOT the State acting for the citizen – an enormous & communistic leap into the maw of a ‘Brave New World’ clearly without ethics or values I would wish to espouse. This entry was posted in Cancer, Cryoablation, Kidney Cancer, Magnetic resonance imaging, Surgery, Tumour and tagged Greg Lance-Watkins, Greg_L-W, NHS Blood and Transplant, Organ Donation, Organ transplantation, Transplantation. Bookmark the permalink.